The Caribbean islands were first inhabited by the Arawak Indians, then were invaded by a more aggressive tribe, the Caribs. Unfortunately, neither could appreciate their victory forever, although the Arawaks may have had a quiet reign of nearly two millenia. Then the Spanish, Portuguese, Dutch, French, Danish, and British arrived, after which the Carib population steeply declined due to various factors. The islands have known many historic battles and more than a few pirate stories. The Caribbean islands are made up of island groups including Greater Antilles, Lesser Antilles, Leeward Antilles, and the Windward Islands. 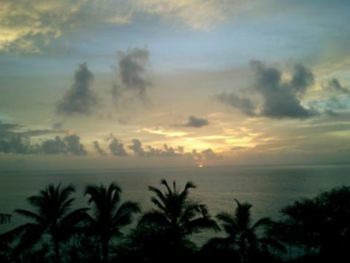 The islands in the Caribbean are also sometimes referred to as the West Indies. Christopher Columbus thought he had reached the Indies (Asia) on his voyage to find another route there. Instead he had reached the Caribbean. The Caribbean was named the West Indies to account for Columbus' mistake. Cuba, Dominican Republic, Haiti, Jamaica, Puerto Rico and the Cayman Islands, often grouped as Greater Antilles, are by far the largest countries in the area and the most visited by travellers. In the north is the Lucayan Archipelago, which includes The Bahamas and the Turks and Caicos Islands. The Caribbean also includes the Lesser Antilles, a group of much smaller islands to the east. Further to the west and south, there are various less frequently visited islands that belong to Central and South American countries. Just a 20 minutes ride away by boat from Saint Martin, Anguilla is a member of the British Commonwealth of nations, Anguilla is not very touristy (yet), but has incredible white sand beaches. Known for its 365 beaches, one for each day of the year. Caters for the eco and budget minded travelers. These countries are not part of the Greater or Lesser Antilles but are variously close to it, and are commonly associated with the Caribbean (e.g. members of CARICOM, the Caribbean Community). Nueva Esparta — is one of the 23 states of Venezuela, granted free-port status in 1973 and located in the Caribbean Sea, just a short distance off the northeastern coast of Venezuela. French Guiana, Guyana and Suriname — culturally and economically a part of the region, but geographically on mainland South America. Belize in Central America also has cultural and economic connections to the Caribbean. Several countries in Central America, South America and Mexico have shorelines — and islands — in the Caribbean. Such islands are typically much less developed and include the Corn Islands (Nicaragua), San Blas Islands (Panama), Los Roques (Venezuela) and San Andres and Providencia Islands (Colombia). Curaçao (CUR), Bonaire (BON) from Miami (MIA) - by Insel Air. If you fly Insel Air, give yourself at least 24 hours grace period between any connecting flights. Insel Air is notorious for their unreliability and poor customer service. British Airways: from London (LGW) to Antigua, Barbados, Cayman Islands, Grenada, Saint Lucia, Tobago and from Manchaster to Saint Lucia. Iberia: from Madrid to Havana, San Juan de Puerto Rico and Santo Domingo. Insel Air Direct flights from Miami and Inter-Island travel. Aruba, Bonaire, Curaçao, Haiti, Las Piedras, Miami, Puerto Rico, Santo Domingo, St. Maarten, Suriname, and Valencia. Intercaribbean: from Providenciales (PLS) in the Turks and Caicos Islands to various Caribbean destinations including Jamaica, Haiti, Dominican Republic, the Bahamas and Puerto Rico. JetBlue to Jamaica, Haiti, Dominican Republic, Sint Maarten, Puerto Rico, Aruba, Saint Lucia and Barbados mostly to New York and Boston and some also to Washington DC, Orlando and Fort Lauderdale. KLM to Aruba, Bonaire, Curaçao and Sint Maarten (SXM) from Amsterdam. WestJet: from Toronto to Sint Maarten. Numerous companies offer cruises, charters, and boat tours in the Caribbean. Jetblue  Expanding its base in Puerto Rico offers budget flights between USA, Dominican Republic, U.S. Virgin Islands, St. Maarten. Express des Iles offers transport between Dominica, Guadaloupe, Martinique, St. Lucia and other islands for about €67 one-way and €100 round-trip. Bear in mind that at some islands, if you are not a legal resident, proof of onward travel may be required. If you fail to provide it, you may get your entry refused by the immigration officer. All of the Americas (with 16.3 killed per 100,000 population) suffer from homicide rates far above those in most of Asia (3.0), Europe (3.0) and Oceania (2.9) but some countries in the Caribbean feature in the highest murder rates in the world. Most visitors are aware of the high rates of gun crime in the United States Virgin Islands (with 52.6) or Jamaica (39.3), but you might be unaware that even sleepy little Saint Kitts and Nevis (33.6) had a murder rate seven times greater than the scary old mainland USA in 2010! 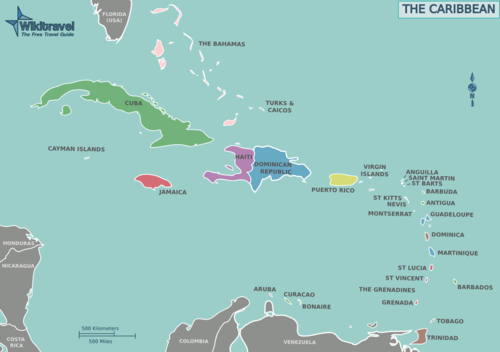 The well policed Bahamas rang up a rate of (29.8), Trinidad and Tobago (28.3), Puerto Rico (26.5), Saint Vincent and the Grenadines (with a state Latin motto of "Pax et Justitia" or "Peace and Justice" had 25.6), Dominican Republic (22.1), Saint Lucia (21.6) and Dominica (21.1). To put this in perspective, rates in more placid countries like Japan, Singapore, Indonesia, Hong Kong, Switzerland, Germany, Spain and New Zealand average well under a single person intentionally killed per 100,000 of their population each year. This page was last edited on 10 December 2018, at 08:49.